After reviewing the eligibility and awards selection criteria below, please submit nominations with brief justifications to cac-leadership at eastraleigh.org. The nominations received will be reviewed and voted on at the September 17th East CAC meeting. Beginning in 1977, the Raleigh Citizens Advisory Council (RCAC) has been recognizing significant efforts by property owners and community groups/individuals to enhance the health, safety, and appearance of their neighborhoods. This year the RCAC asks each individual CAC to select one award winner to be honored Wednesday, October 17, 2012 – location TBD. The awards are designed to acknowledge those unsung heroes who work without thought of praise to make our communities better at the grassroots level and in so doing, elevate the quality of our lives and of our city. 2. Educational institution or non-profit organization that has partnered with a neighborhood group or organization. 4. An individual who had contributed significantly to the well-being of the CAC community. 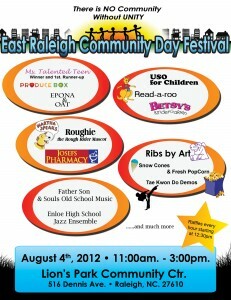 Don’t forget that this Saturday – August 4th – is the 2012 East CAC Community Day! This year’s theme is “There is no COMMUNITY without UNITY.” It will be held at Lion’s Park from 11:00 – 3:00 and you won’t want to miss it! We’re having free food, free music and all kinds of other free stuff! Come and enjoy the festivities with your neighbors – meet new friends, enjoy good eats and music, bring unity to our community!